The growth of the market can be attributed to the application of UV/visible spectroscopy in environmental testing; growing use in the pharmaceuticals and biotechnology industries; technological advancements in instrumentation; and increasing need for food analysis. The market is expected to witness the highest growth rate in the Asia-Pacific region. North America is expected to account for the largest share of the global UV/visible spectroscopy market. However, the longevity of instruments and dearth of skilled professionals is likely to restrain the growth of the market to a certain extent during the forecast period. The single-beam systems segment is expected to account for the largest share of the market, by instrument type. However, the array-based systems segment is expected to grow at the highest CAGR. The technological advancements in the array-based systems segment enable it to offer advantages such as improved sensitivity and faster data collection. These factors drive the growth of this segment. The major players in this market include Shimadzu Corporation (Japan), PerkinElmer Inc. (U.S.), Thermo Fisher Scientific Inc. (U.S.), Agilent Technologies Inc. (U.S.) and Hach Company (a subsidiary of Danaher Corporation) (U.S.), Jasco, Inc. (U.S.) Hamamatsu Photonics K.K. (Japan), Horiba, Ltd.(Japan), Hitachi High-Technologies Corp. (Japan) and Buck Scientific (U.S.) among others. The worldwide Market is divided into North America, Europe, Asia-Pacific, and the Rest of the World (RoW). North America is expected to account for the largest share of the UV/visible spectroscopy market. 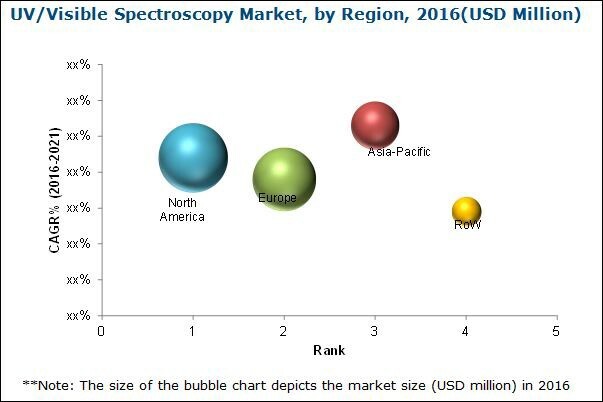 However, the Asia-Pacific market is slated to grow at the highest CAGR during the forecast period and serve as a revenue pocket for companies offering UV/visible spectroscopy systems and accessories. This is owing to the impetus provided by an entry of key market players into this market, growing food safety and environmental pollution concerns and budding life science R&D sector in this region.